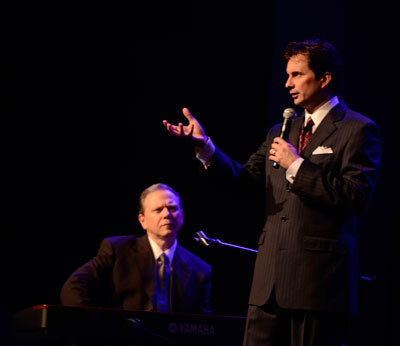 At any one of Abraham Productions’ events, like the Gatlinburg Gathering, there’s always something going on! Once the afternoon showcase ended, we strolled down the street, had a burger at Five Guys (my first experience at that particular establishment. *wink*) and then hiked back to the convention center to see the other free showcase in the exhibit hall. The singing there was hosted by Greg Cook and Victoria Huggins. 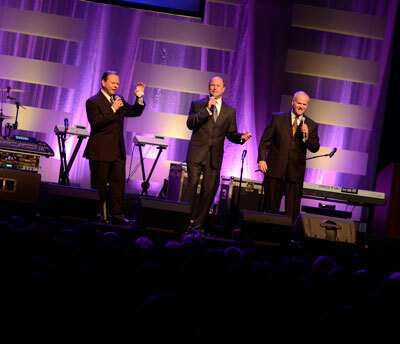 Some of the artists I heard sing were Ashley Yoder, the Nehrkorns and the Whisnants. Soon the doors opened for the evening concert and when I heard the Wilmington Celebration Choir singing inside, I knew it was time to go find my seat! The Celebration Choir was singing O Happy Day when I walked in and Ray committed the evening to the Lord in prayer when the song ended. “We try to make our concerts more like church,” he said, “and see people come to know Him…and once you know Him, there’s nothing like Him.” The choir went on to sing two more numbers, one being Jesus Is Alive and Well. “That’s one way to get it kicked off tonight,” said Greg, as Michael Booth and another guy came up on stage to remove the choir mics. “These gentlemen who are coming to sing tonight were with the Chuckwagon Gang…I mean the Cathedrals!” (Speaking of Mark Trammell.) 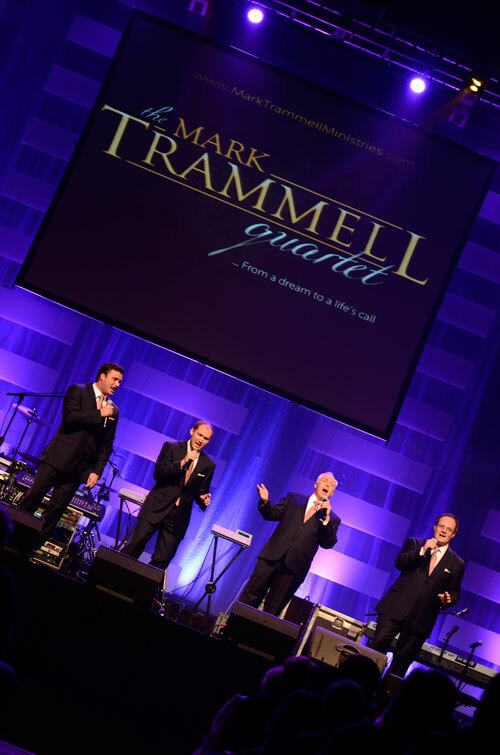 As Michael darted in front of Greg one last time Greg called out to him, “How many Pollock’s does it take to move three choir mics?” LOL Anyway, the Mark Trammell Quartet was first to sing for us that night and they did so with How Long Has It Been. As the background turned to a bright purple, their second song, Meet Me Over On the Other Side, began. Mark greeted the crowd and introduced the group. Pat Barker was last to be introduced and the next song featured him also, Wonderful Time Up There. Way Past Ready followed. Mark explained that many folks came by their product table and asked for a particular song called I Want To Know – as they sang it, it quickly received a standing ovation. “I’ll leave you with this,” said Mark, “If we could sing one song to the entire world, we’d have to sing this one.” If you guessed The King Is Coming, you were right! And if you’re wondering if the crowd could stay in their seats, I assure you, they couldn’t! “Isaiah 40:28,” Greg announced, “’Hast thou not known? Hast thou not heard, that the everlasting God, the Lord, the Creator of the ends of the earth, fainteth not, neither is weary? 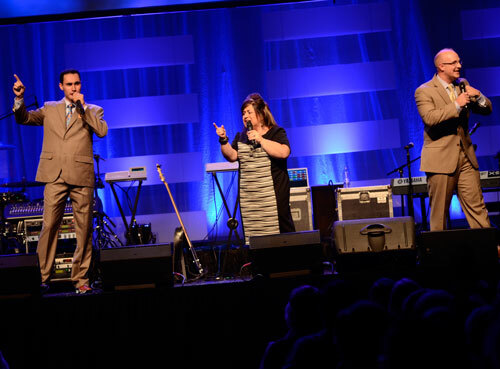 There is no searching of His understanding?’ Ladies and gentlemen, please make welcome, the Perrys.” As Bryan, David and Libbi walked out on stage, the crowd stood to their feet, bringing tears to Libbi’s eyes. They took a moment and then began singing Plan Of Salvation; when they came to the first verse the screen behind them lit up and a video of Tracy singing the verse appeared. (What a captivating moment!) Bryan asked everyone to clap along as they went into I Got A Hold Of God This Morning. “Well, how is everybody doing tonight,” he questioned, “It is an absolute privilege to be at the Gatlinburg Gathering again and a joy to see all your smiling faces…well, most of you.” LOL During the introductions while he spoke about Libbi, the crowd rose to their feet and then she sang Through the Night. Afterwards, Libbi thanked the crowd for praying, sending cards, messages, etc. “There is no way I can stand here tonight without thanking Jesus Christ,” she said, and went on to explain how easy it is to stand on stage and say you have faith and then when tragedy comes, you realize how much faith and trust you really have. “You know what I’ve found, the verse that says ‘I will never leave you nor forsake you’ is true.” Then she quoted Isaiah 41:10 and shared how that verse “creeps” up on her every day. *wink* They closed with two songs that just say it all: Great Is Thy Faithfulness and If You Knew Him. Bryan sang Great Is Thy Faithfulness accapella with a conviction and power that once again, held the audience captive. David closed with If You Knew Him and I must say, the audience hung on every word. Standing Ovation!!! “This family right here will absolutely take you to the throne of God,” Greg exclaimed, “The Bowlings!” I’ll Be Alright As Soon As I Touch Calvary and Sweet Is The Victory kicked off their set. “Didn’t we have a time this afternoon?” Mike stated as he asked how many made it out to the afternoon matinee. After introductions, Kelly stepped forward and said, “When you see Libbi tonight you’re seeing a picture of grace,” and went on to recount the story of their bus accident, again, as photos flashed across the screen. Your Cries Have Awoken The Master and I Never Shall Forget the Day followed. (That last one received a standing ovation.) “How many are thankful for the cross?” Mike asked. The ballad I Still Glory In the Cross ended their set and they sang a little of The Old Rugged Cross as the podium was set up for the preaching. Dr. Hoskins turned to one side of the stage and asked Gerald to come up and softly play on the keyboard and then he called his daughter (who is nine years old, I believe) to come up also. “You know why I want revival?” Phil asked as he knelt down next to his daughter. Putting his arm around her shoulder he gave us the answer, “Right here.” Then he asked, “Who will come down here and pray with me?” Phil had no longer spoken those words and folks were out of their seats and moving down the aisles. He only had to ask the question once, and half of those in the audience were coming to pray. Minutes later the front was full and the aisles overflowed with praying Believers. For 5-10 minutes the room was filled with voices lifted up to the throne. What a poignant moment. When Greg dismissed us to go back to our seats, it was time for Greater Vision to sing. That moment was special. There were a lot of people trying to get back to their seats, but they were all so quiet, no one was in a hurry and no one made a lot of noise. The Spirit of the Lord was heavy and really had everyone’s attention. If you can picture that moment and the sweet reverence that clung to everyone in the room, then you’ll grasp how precious it was to hear the lyrics sung softly and worshipfully, “He was seeking for me; Jesus was seeking for me – though I knew Him not, still loved me and was seeking for me…” A lady next to me whispered, “Hallelujah.” (The transition was seamless and the message impeccable.) He’d Still Been God and Come Unto Me followed. “Well, it’s great to be back in Gatlinburg,” said Gerald, “I have heard Hoskins preach many times for 30 years, but tonight he was on! That was something we needed to hear.” Setting up the next song, he explained, “If you like the truth of the Gospel you are going to love this song.” It was a song that would encourage pastors entitled Preacher, Tell Me Like It Is. They sang My Name Is Lazarus and Gerald smiled for the lady who was the event photographer. “Thank you,” Gerald said smiling, “I was told we wouldn’t be allowed to leave the building if we didn’t sing that song.” Stepping back to take a seat at his keyboard, he spotted the photographer again, “Are you gonna’ take my picture? Do you want an action shot like…” and then raised his hand like he was playing a wild song on the piano and made a silly face. LOL They ended their part of the program with I Know A Man Who Can and received a standing O. “Keep your hands together and welcome now…the Booth Brothers!” exclaimed Greg. Castles In the Sand opened the BB’s set and Michael introduced their second song with these words, “Here is the reason we have so much hope!” Because He Lives followed along with Since Jesus Came, We Believe and Feeling Mighty Fine. (We Believe had a standing ovation!) Michael took a moment and told the audience that there was a time they use to run around the stage on that song. “Now,” Michael went on, “we think, ‘Do we want to run, jump or sing…cause we can’t do both! Speaking of old…where is Gerald? We just love piano players and the best kind are free ones.” Giving Gerald’s forearm a good shake Michael added, “YOU are one of the best ones!” LOL On a serious note, Michael shared how critical he is of altar calls because sometimes emotions get manipulated through the moment, but of what we just experienced he said, “What we saw tonight was the real deal.” With Gerald accompanying him, he sang Look For Me At Jesus’ Feet in closing. Conclusion: Before I forget! The dates for the Gatlinburg Gathering next year are July 2-5th. There are so many things I could say about each group that crossed the stage Friday night, but the most important thing that happened that evening came in the message of Phil Hoskins and the prayer afterwards. Like Michael said, there was no “emotional experience,” rather, the Lord just spoke to our souls and said, “Go pray,” and most everyone did. The way Greater Vision began their set with Seeking For Me was the classiest thing I saw all week. We hear artists talk all the time about changing their song selection on the spot to match the spirit in the room and they executed that with the utmost precision. I’m so glad that we have folks on stage who don’t mind stepping out of the spot light to keep the focus on the Lord.